Anti VEGF therapy is used to treat cancer and wet macular degeneration by preventing new blood vessel growth. So you may ask, how can a drug used to treat tumors be of benefit to a person with wet macular degeneration? Our eyes will try to develop new blood vessels when they are lacking oxygen due to poor circulation or because the tissues are clogged. However, the blood vessels that develop are abnormal and they leak. When these abnormal blood vessels form behind the retina and start to grow in the macula the leaking blood and fluid cause damage to the macula and results in loss of central vision. The growth of these new blood vessels is called angiogenesis. Vascular endothelial growth factor (VEGF) is secreted by cells that are oxygen deprived and stimulates the growth of these abnormal blood vessels. 2) Fluid and blood leak from these weak blood vessels- the fluid around the retina leads to visual distortions and blank spots in one's vision. 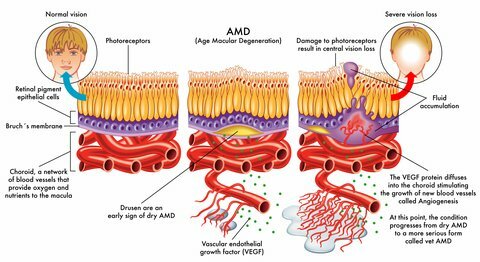 Anti-VEGF macular degeneration medications inhibit and block the growth of new, but abnormal and undesirable blood vessels. They are given by injections directly into the eye and benefit patients who have active leaking blood vessels. This wet macular degeneration treatment helps to slow the progression of fragile blood vessels leaking fluid into the macula. Ophthorobotics for Future Eye Injections? While many people experience positive changes in their vision or stability of their vision due to anti-VEGF therapy, receiving injections into the eye can be uncomfortable. The anticipation of regular eye injections for possibly years can cause many patients to experience fear and anxiety. What if the process could be improved with more precision, accuracy and speed? Opthorobotics is a company founded by researchers from the Swiss Federal Institute of Technology in Zurich, Switzerland along with retina specialists from Triemli Hospitals. They are working to develop a robot that can give eye injections with greater precision and safety. “Our robot will be the first to help in administering eye injections,” says Franziska Ullrich, the CEO of Ophthorobotics and mechanical engineer at ETH. According to the Opthorobotics website, "The state of the art technology utilizes specific sensors to identify and track patients’ eyes, and screens for counterfeit medication." The prototype is still in development to be used in the future in clinical settings. The drug is actually injected inside the eye (intravitreous injection) as an in office procedure that is best performed by ophthalmologists who are specially trained in Retina and Vitreous surgery. Although not a cure for macular degeneration, anti-VEGF therapy slows the progression and development of new, leaky blood vessels. Usually injections need to be administered every few weeks or months. These four drugs belong in a class of drugs called anti-VEGF (Vascular Endothelial Growth Factor. These types of drugs reduce the growth of abnormal blood vessels - in tumors and in wet macular degeneration . "The safety and efficacy of Macugen was studied in two trials in patients with wet AMD for two years. Patients treated with this drug exhibited a significant decrease in vision loss in both trials. Serious adverse events related to the injection procedure included infections, retinal detachment, and traumatic cataract. Other frequently reported adverse events in patients treated with Macugen were eye irritation, eye pain, hemorrhage under the outer membrane of the eye (conjunctiva), and blurred vision." Lucentis (generic name is ranibizumab) was FDA approved in 2006 for the treatment of wet AMD. In clinical trials it was shown to be effective to stop retinal bleeding and in some cases reverse some of the signs and symptoms of wet AMD. Normally it is administered monthly as an eye injection for 4 months and then upon re-evaluation by your eye doctor may be given less frequently. The Lucentis Co-Pay Card Program helps to cover some of the out-of-pocket expenses. This program is for those who have commercial or private insurance, but is not for those who are on Medicare. There are other eligibility requirements as well. The FDA approved Avastin (generic name is bevacizumab) in February 2004 for use in combination with another chemotherapy drug as a first-line treatment for metastatic colorectal cancer. When a drug is used for a condition that the FDA has not approved it for, it becomes what is called "off-label" use. Avastin, not FDA approved for macular degeneration treatment, is used by ophthalmologists in what is called off-label use. Several clinical trials have compared the effects of Avastin to Lucentis. The cost of Avastin is much less than Lucentis. However because Avastin has not been formulated to be injected in the eye it has to be re-packaged to be given as an intravitreal injection which causes more concern for eye infections. Avastin® (bevacizumab) is the first U.S. Food and Drug Administration (FDA) approved therapy designed to inhibit angiogenesis, the process by which new blood vessels develop and carry vital nutrients to a tumor. Typically, the retinal specialist will ask a compounding pharmacy specializing in sterile (aseptic) compounding to transfer the Avastin™ (bevacizumab) from the manufacturer's vial into prefilled syringes containing a single dose. This injection is then administered by the retinal specialist, usually in an office setting. "Both drugs were highly effective regardless of the approach to dosing. There was slightly less vision gain with as-needed treatment. Patients seeking the small extra advantage of monthly treatment need to be mindful of the additional burden, risks, and costs of monthly injections. Since as-needed dosing required 10 fewer eye injections over the course of two years and yielded similar visual results, many patients may choose this option.” said Daniel F. Martin, M.D., study chair for CATT and chairman of the Cole Eye Institute at the Cleveland Clinic. Eylea (clinical name aflibercept)is one of the latest treatments for wet macular degeneration. Given as an injection into the eye, clinical trial results are showing that this macular degeneration medication can offer similar results with less frequent eye injections. Eylea by Regeneron, was FDA approved in November of 2011. Another name for this macular degeneration medication is VEGF Trap Eye. Just like the other medications, it is also given as an intraocular injection. What makes Eylea different from Lucentis and Avastin is that it can be given less frequently meaning, less trips to the doctor, less cost and less inconvenience. It may be given possibly every other month rather than monthly. The retina doctor will determine the frequency schedule depending on the patient's response. For those going to the doctor's office for frequent injections, it means less trips to the doctor, less costs for treatment, and less eye injections. According to recommendations from Regeneron Pharmaceuticals, the company that makes this medication, "2 mg of Eylea is to be administered by intravitreal injection every 4 weeks (monthly) for the first 12 weeks (3 months) followed by 2 mg once every 8 weeks (2 months)." View 1 (VEGF Trap: Investigation of Efficacy and Safety in Wet AMD) and View 2 were two Phase 3 clinical trials with 2457 participants. Study sites included facilities in the United States, Europe, Asia Pacific, Japan and Latin America. It was found that patients who received 2 mg of EYLEA every eight weeks achieved visual acuity gains similar to Lucentis with 5 fewer injections, on average, over two years. Some patients who are treated with Lucentis or Avastin do not show any improvement and don't respond to these avnti-VEGF medications. Others may respond initially, but then become resistant to it and no longer benefit from regular eye injections. In the past that meant that there was no longer any FDA approved treatment available to them. However, a recent study at the University of Iowa is showing another benefit to Eylea other than less frequent eye injections. Half of the eyes of the 31 patients with macular degeneration had reduced fluid after three monthly injections. What makes this study population different from other studies, is that the patients had all been previously treated with Avastin or Lucentis. 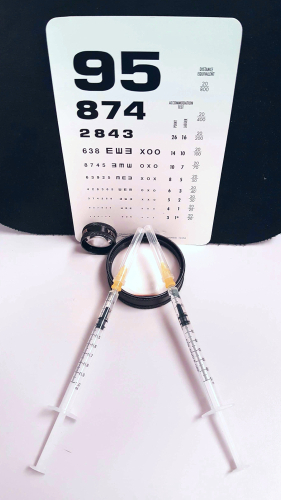 Eylea is formulated and prepared specifically for intravitreal injection, unlike Avastin, which is given as an off-label medication and has to be repackaged by compounding pharmacies. Usually a patient is given multiple injections over several months. Eye infections have occurred in patients who have been given Avastin. Avastin is given as an off-label use and needs to be re-packaged or compounded to be given as an eye injection. 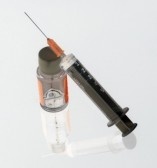 The extra step of compounding Avastin increases the risk of infection if not done properly and with sterile technique. "The incidence of sustained elevated intraocular pressure (IOP) in patients receiving intravitreal anti-VEGF injections is significant. Additionally, these data suggest the possibility of a heightened risk for further elevation of IOP in patients with pre-existing glaucoma who receive either bevacizumab or ranibizumab. Prospective studies are needed to verify these results and better understand the implications of these findings." The manufacturer, Genentech Inc., has notified eye doctors and the FDA that it may increase the risk of stroke. Genentech, Inc. informed doctors that patients receiving the highest dose (0.5 mg.) had a 1.2 percent risk of stroke, four times the 0.3 percent stroke risk of a lower dose (0.3 mg.). People who have already had a stroke appear to be at the highest risk. The drug packaging already contains warnings that it may cause clotting problems and strokes. Genentech will continue to monitor the stroke risk. If you have already had a stroke or have other stroke risk factors, or are concerned about the increased stroke risk, you should talk to both your eye doctor and primary physician. These drugs can interact with other medications. Tell your eye surgeon about all the medications you are on, including prescription and over-the-counter drugs and supplements. Call your eye doctor right away if your eye becomes sensitive to light, painful, or you develop a change in vision during your treatment. The macular degeneration information presented here is for educational purposes only and does not provide specific medical advice. The statements on this site have not been evaluated by the Food and Drug Administration and are not intended to diagnose, treat, cure, mitigate or prevent any disease. Always consult your doctor for personal medical advice, with eye health questions about your specific medical conditions and before starting any treatment, diet, exercise, or supplement program. The WebRN-MacularDegeneration website does not endorse any medical or professional service obtained through information provided on this site or any links to this site. Use of this web site does not replace medical consultation with a qualified health or medical professional to meet the health and medical needs of you or others. While the content of the WebRN-MacularDegeneration web site is frequently updated, medical information changes rapidly and therefore, some information may be out of date, and/or contain inaccuracies or typographical errors.